The famous dairy family who started farming in Florida in the late 1920s with a handful of Jersey cows own McArthur Golf Club. My, how times have changed. The McArthur’s have diversified and created a private “sanctuary for pure golf”, so you’ll need to befriend one of the lucky members to tee it up here at Hobe Sound. The McArthur’s teamed Tom Fazio with Nick Price to fashion a course that has “wow factor” and is picturesque. 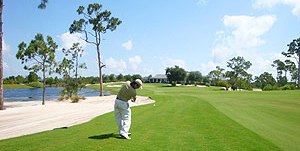 Spread over nearly 1,000 acres of sugar sand property (sugar sand is a common Floridian name for sandy loam) the course has been thoughtfully designed with multiple tees for the low and high handicapper. Fazio and Price certainly felt the earth move as they shifted more than a million cubic yards of sugar sand to create a course that “rests lightly on the land”. Lakes were created and the course was shaped to wind through four Floridian ecosystems; prairie wetlands, sand pine scrub, barrier dune line and hardwood hammock. With no homes or development around the property, McArthur really is a blissful sanctuary to seclusion. Golf in Florida is something that I have many qualms about. Yes it is wonderful to be able to play in shorts during the winter and have the opportunity to sharpen your game before the season. However for the most part golf in Florida is bland and monotonous, many courses were laid out almost as if they rolled off a” production line”, plentiful water hazards, holes lined with scrub, many times you play a hole on a new course and think “ havent’t I seen this somewhere before”. I will concede that the topography of Florida for the most part is not ideal for the construction of great golf courses (nearly two thirds of the state is a swamp), but that being said in the middle of the last century too many architects fell into the trap of designing water laden, flat, uninspiring tracks and as such gave birth to the concept of a Florida Golf Course. There are a couple of exceptions to the above, most notably places like Seminole, Mountain Lake and Pine Tree, which were all golden age tracks. Thankfully the renaissance we are now seeing amongst top architects has over the last few years breathed fresh life into Golf in the Sunshine State. McArthur is one such place. The club is brainchild of Nick Price and he alongside Tom Fazio is responsible for a truly fantastic golf course. First and foremost McArthur is a golf club, they are no houses lining the fairways, no pool, tennis courts or ladies who lunch in the club house. For me as a golfing purist this is a huge thumbs up. There is something raw about McArthur, when you are out in the thick of the golf course, there is a feeling of seclusion that you rarely find, you get the sense you have descended on a hike through the wilderness with your clubs on your back and your mission is to navigate the 18 holes to the best of your ability. The Opening hole is a stiff one, especially if the customary Palm Beach Breeze is blowing against, a par 4 with a green heavily guarded by sand, par is a good score here. From here the course meanders around in almost a figure of 8 shape, with holes 3 (a short par 3 played to a postage stamp sized green), 6 (a great risk reward dogleg left par 4, with water all along the left side) and 9 (a nice medium length par 5, with an hourglass shaped green that has some devilish pin positions). As I stood on the tenth tee I made two observations to myself. Firstly the greens were probably the quickest Bermuda greens I had ever played on and secondly how much more of a real golf course it was as opposed to many of its south Florida counterparts, I found myself eagerly anticipating the back nine as opposed to “I have seen this before”. I enjoyed the front nine but loved the back 9, one great hole after the next with not a weak one in the mix. The tenth is a great dogleg right par 5, where even the lay up shot needs to placed in the right area of the fairway to even have a chance of holding the green. The 11th a super par 4 back up the hill played to a green which falls sharply from front to back and left to right, allowing the player to use his imagination to work his ball toward the hole. The stretch of 12, 13, 14 provide a couple of great “fun” golf holes, two short par 4’s and a nice par 3 with an open entrance to the green affording the player many option to get the job done. These are the type of holes you could play in 3 under or 3 over without doing much wrong. The last 4 holes provide a grandstand finish. The 15th is a great dog-leg left par 5 played to a fairway that lies above the level of the tee, which after its plateau falls drastically downhill, if you can hit a sweeping draw and catch the slope its green light for eagle, the green complex is protected by water short and pines and sandy scrub long and right. 16 is a great par 4, played slightly uphill to another viciously sloping green, again placement off the tee is paramount as anywhere too far right and your view of the green is heavily obscured. 17 offers some slight respite, however if you get on the wrong side of the flagstick you may end up playing hide and seek with your golf ball. McArthur finishes with one of the strongest holes in all of America. Think the 17th at East Lake, except with pines and sandy scrub as opposed to verdant rough. Your drive must hug the left centre so as to avoid lengthening your second shot, however the risk you run is going too far left and either playing from a waste area or worse ending up with the Gators. However the challenge only begins when you reach the fairway, the prevailing wind usually blows straight into your face, from the back tee I cracked a driver and still needed a good solid 4 iron to reach the front edge. The green may be one of the best contoured on the course with the back left hole location adding at least half a shot to the degree of difficulty from an already very tough hole. As you can gather I really enjoyed McArthur, in much the same vein as I am a fan of places like Boston Golf Club and Friars Head, they have sculpted a traditional golf course, with traditional pure golfing values in the modern era. The course is as stiff a test as you will find from the back tees, however the course is eminently playable for the average golfer, affording a bale out option from virtually every tee. The standard of golf in Florida is ever improving and expect great things from Streamsong on the gulf coast, where 2 golf courses one a Doak design, the other a Coore/Crenshaw will be sure to make the headlines. Watch this space! Can a place for golf be absolutely perfect? McArthurs is one of the "yes" answers. Everything is on place, a very nice proshop, excellent food at the restaurant and the golf course ... WOW!!! Design is challenging and creative, greens run a speed of 13 feet, fairways are so tight and I was so lucky to play it one week before US Open´s final qualifying so it was in outstanding shape. I cannot choose one hole, all of them are nice and different, but as hit a perfect 2nd shot on 10th for a 2 putt birdie, I have to select it as my favourite hole. If you are lucky to be invited, enjoy every second of your visit.